Four years in hiding seem to have done Jack Bauer a world of good. In the person of Kiefer Sutherland, he still looks fighting fit, and he sounds more interesting than he has in a long time. Being on the run seems to have furrowed his voice as well as his brow; he’s more introspective than before and seems to be carrying a heavier load of guilt, though he’s rarely specific as to what he’s guilty about. The worst thing he ever did was cause the death of his wife back in 24’s first season, and he had only indirect responsibility even for that. No season since then has had so ingenious and involving a storyline; but the new one – 24: Live Another Day – is running it close. This new series is set in London, conceivably because it’s cheaper to film in Britain than in the USA. That isn’t the only economy that’s been imposed; Jack now has only half his previous number of hours to perform his regular job of detecting an apocalyptic threat and then defusing it. This accounts for the bemusing new title; if they hadn’t dreamed it up they would have had to call the show 12. Apparently, though, the show will still cover a 24-hour time period, but certain hours will be omitted from the action. This hasn’t happened in the episodes shown so far, and I’m not certain how it will be handled when it does. Will all the characters be presumed to have taken a nap, so as to conserve their strengths for dealing with the ongoing grave international crisis? Or will the story simply wind up and then start all over again, perhaps with the revelation of a new threat behind the threat? It’s been known to happen on 24; in fact it’s been standard procedure. It seems that Jack is not going to have everything wrapped up before his bedtime. Another all-nighter beckons. Not that he’s having it easy even now. There are at least four separate organisations, some of them governmental, opposed to, or at least not totally on board with, Jack’s mission of saving London, and the visiting U.S. president, from a multi-pronged drone attack using missiles electronically re-directed from the Americans’ own arsenal in Afghanistan. A lot has happened in the world since Jack last showed his face in it, and the show is doing a brilliant job of combining at least three of the new geo-political factors. We have drones. We have a female Islamist mastermind (mistressmind?) intent on avenging, with maximum prejudice, the death of her husband, and clearly modelled on Britain’s own Black Widow. We have an underground network of computer-nerd whistleblowers obviously inspired by Julian Assange. The writers must be kicking themselves that they got to work before Putin moved on Ukraine; it might have lent a new dimension to the Russians’ ongoing vendetta against Jack. They are still apparently after his head, for reasons that I don’t clearly remember but that go back several seasons. There’s no statute of limitations in Bauer country. Jack may be unkillable, but he isn’t beyond criticism. Witness the character attack levelled at him by the super-hacker Julian figure, rather transparently re-named Adrian. “You should” he said “ cure yourself of the habit of asking favours of people while pointing a gun at them.” That’s the best line anyone’s had on 24 since the golden days of Jack’s CTU superior George. (Remember George, Seasons 1 and 2? He had a great way with the dry wisecrack. Of course they had to kill him.) Of course Adrian’s attitude to Jack, quite apart from their political differences, is hardly unbiased, since Adrian is in love with Chloe. Apparently, when word of a new 24 season first got out, fans insisted that it could not go ahead without Chloe. So there she is, and as great as ever. Maybe better: Mary Lynn Rajskub now comes equipped in the role with a Goth eye-shadow and hairstyling, befitting her new bitter backstory. Her husband and child have been killed, by assassins who were really coming for her, because of her role in helping Jack, a role she has of course played just about every moment since we first met her. Maybe she isn’t as funny as she used to be, but she might be more darkly witty; she retains her old verbal gift for subversive subservience. Her awesome keyboard skills are now in the service of Adrian and his merry band of information-liberators, a service that sometimes conflicts with her loyalty to Jack. Guess which wins. Chloe and Jack have shared some, for this show, surprisingly tender and touching scenes; I’ll swear that at one point he actually put his arm around her: just to comfort her, you understand. Chloe still helps Jack with her supernatural ability to feed him the schematics of any building anywhere, the moment he sets foot in it. Even Jack, scouting for possible attackers, can’t see round corners, but he doesn’t have to; Chloe does it for him. Chloe is officially Adrian’s girl-friend, at least Adrian seems to think so. But she is of course still in love with Jack. He, to Chloe’s secret pain, is still in love with the former Audrey Raines who has recovered from the catatonia into which Jack’s previous activities had cast her, and has married a Paul Gross lookalike who is chief of staff to the President of the USA and so probably has a disloyal agenda of his own. (He certainly keeps acting shifty, but that could just be the show fooling us.) The President is actually Audrey’s dad, the former Senator Heller who, as played by William Devane, looks and sounds extremely presidential, in an anxiously fair-minded sort of way. There are suggestions that he has early-onset dementia, but that could be a vicious rumour. His UK opposite number is played by Stephen Fry who might seem like dream casting for a British PM, but who remains just that, a dream: a fond and foolish one, of the kind dreamed only by Americans. He sounds bumbling even when the things he’s given to say are quite trenchant. Of course, that could be how Britain in its glory fooled the world. Jack and Audrey have had a scene together; a laconic but emotional one in which Sutherland and Kim Raven conveyed their continuing mutual devotion in touching if barely audible tones. Then there’s Kate Morgan, suspended CIA agent, the CIA being this season’s anti-terrorist agency of choice. (RIP, CTU.) 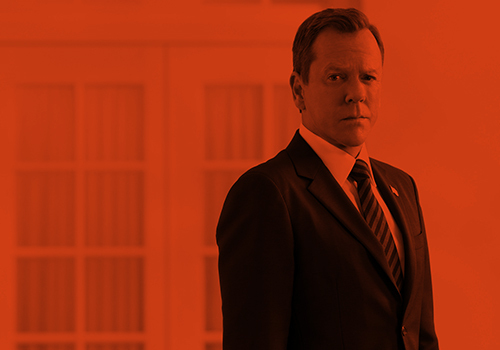 Previously on 24, or actually before the season got started, Kate had fallen under a cloud when her late husband was detected betraying secrets to China. But she keeps being put back in the field, because she alone was able to track Jack. Once his implacable foe, she’s now become convinced of his righteousness and willing to go to perilous lengths to prove it. In fact she seems such a good gal that there has to be something fishy about her. Alternatively, she’s being groomed for the role of Jack’s new love-interest, a position with historically dubious prospects. There’s always been a paradox about 24; its premise is that there’s an agonizingly small window of time in which to avert Armageddon, but the authors have often seemed at their wits’ end to find ways of keeping that window open. Almost every episode follows the same pattern: the good guys have a plan to avert disaster, it ALMOST works, then something goes wrong, and we have to start all over again. Executed with expertise, it’s a foolproof way of generating suspense; even at its most absurd, with the writers frantically spinning their wheels to fill the allotted time, the show has been a seat-clutcher. But, with nothing to cling to BUT suspense, the end of a season has inevitably left us feeling empty. This season, with the time compressed, the acting and writing excellent, the action scenes reliably exciting, the jinx may possibly be broken; there’s an unaccustomed sophistication about it, even some moral complexity, a smidgen of doubt allowed as to whether there may actually be any good guys. So far anyway, at 6 out of 12, it’s a great ride. As Chloe used to say – she doesn’t any more, though I think I heard somebody say it to her – copy that. This entry was posted by Courtney on Tuesday, June 3rd, 2014 at 12:48 pm. It is filed under 24: Live Another Day, Articles, General. You can follow any responses to this entry through the Comments Feed.